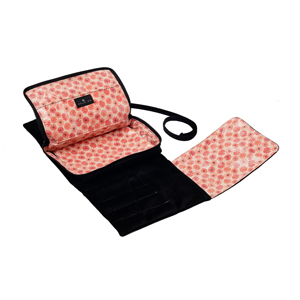 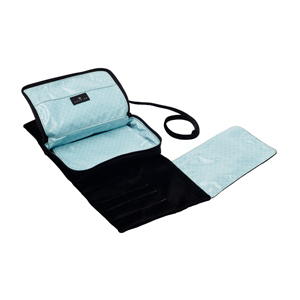 The Hold Me Bag - the everyday makeup bag for home and for travel. 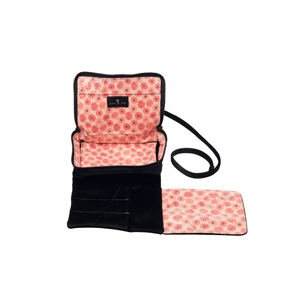 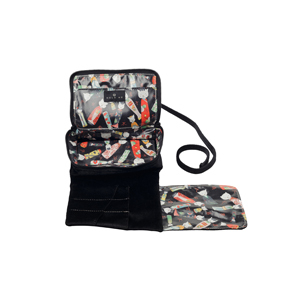 A combination cosmetic bag and brush organizer, the smart, at-a-glance design holds makeup in a zippered center section and keeps brushes at your fingertips, upright, fresh and safely stored. 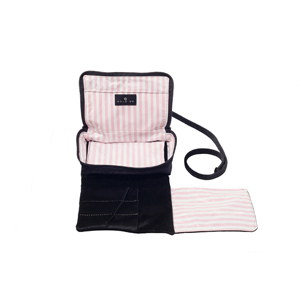 Fashioned after a vintage schoolgirl's book bag, it features a wrap-around self-tie, and is as stylish as it is functional. Handmade in the USA. 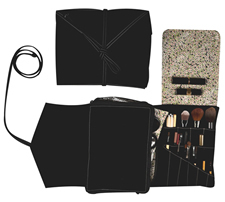 The Hold Me Bag - the largest bag for makeup lovers with lots of brushes and cosmetics. Expandable center section, the "Heart" of the bag, is fully zippered. 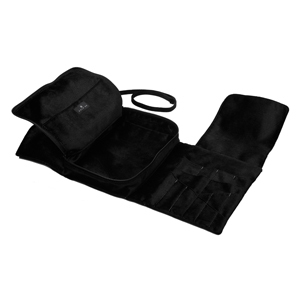 Covered brush section has 12 sleeves to hold single/multiple brushes up to 9" long. 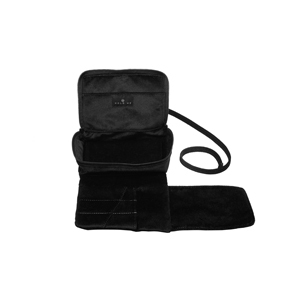 Bag exterior is crafted of soft black velvet fabric which is easy to clean. 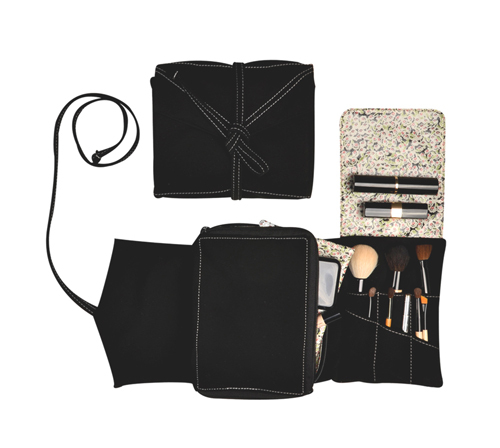 The Hold Me Middle Sister Bag - just the right size for a small brush and makeup collection. Expandable center section, the "Heart" of the bag, is fully zippered. 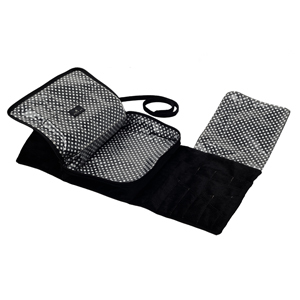 Covered brush section has 8 sleeves that hold single/multiple brushes up to 8" long. 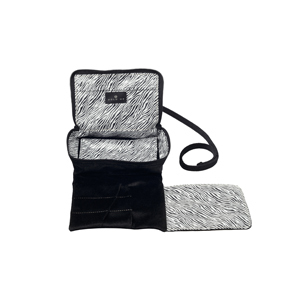 Bag exterior is crafted of soft black velvet fabric which is easy to clean. 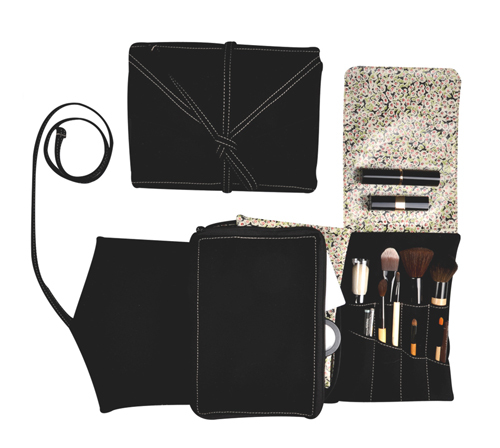 The Hold Me Baby Bag - this smallest version is for the makeup minimalist with just a few brushes. 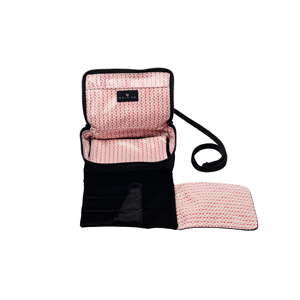 Or that little bag to tuck in your purse. Expandable center section, the "Heart" of the bag, is fully zippered. 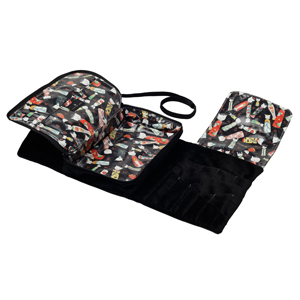 Covered brush section has 6 sections; holds thinner, travel-sized brushes up to 6" long. 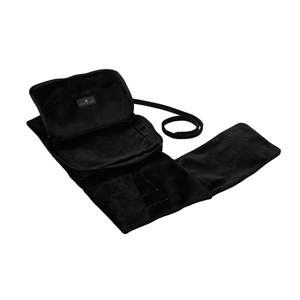 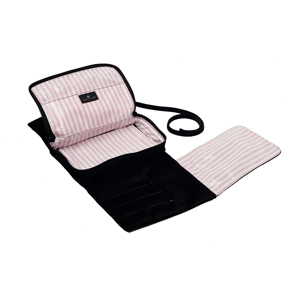 Bag exterior is crafted of soft black velvet fabric which is easy to clean. See how much they hold here.